Music for Myanmar will raise awareness and funds for deaf, orphaned and disadvantaged children in Myanmar with a fundraising evening starring Italian singer Matteo Setti and Myanmar artist Chan Chan in the Chatrium Hotel Royal Lake Yangon on October 10th 2015. “This is our second musical event in Yangon, and thanks to Chatrium and our sponsors it will contribute to giving needy children a fulfilling education and a better future,” said Pamela McCourt Francescone, founder of the non-profit charity Link for Aidthat is organizing the event in partnership with Chatrium Hotel Royal Lake Yangon. The recipients of the evening’s proceeds are a poor but happy orphanage in Dala, the deaf and hearing-impaired children at the Mary Chapman School, and a monastic school that welcomes children of any religion and ethnic background. The Parami Orphanage, which is located in the rural township of Dala outside Yangon, was founded by Mr Win Maung and his wife Mrs Phyu Phyu, who have taken under their wing 22 orphans from the ages of 4 to 18. The Parami children have already benefited from funds raised by Link for Aid with the help of a team from Shangri-La Serviced Apartments Yangon: their home has received a much-needed makeover, a new water-collecting tank has just been installed and a small in-house library. Link for Aid has also set up for them the Sunshine English Classes with the help of volunteer teachers. Music for Myanmar will also benefit the Mary Chapman School for the Deaf, which Link for Aid has been supporting for many years. It is the oldest school for the deaf and hearing-impaired in the country and has over 350 students, aged 6 to 18 years. 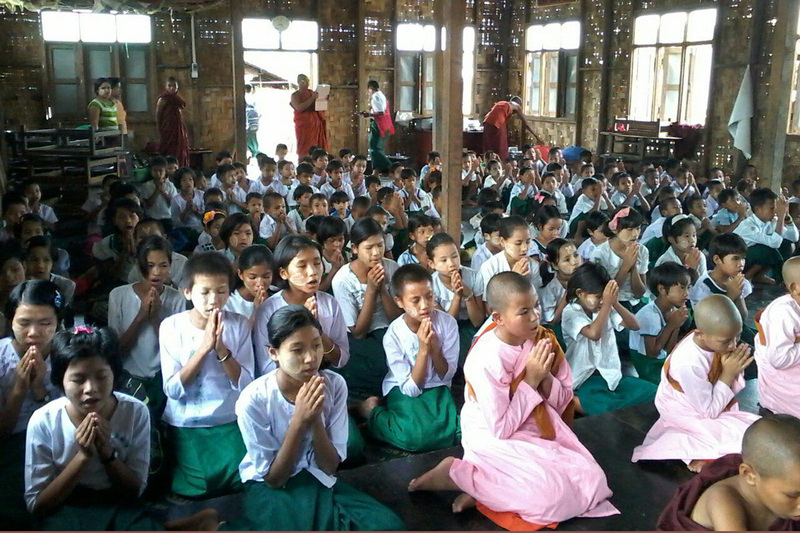 Nawarat Monastic School, located in Shwe Pyi Thar Township, is the third institution Music for Myanmar will support. Founded in 2012 by headmaster Sayadaw U Kay Lar Tha, it has come to accommodate over 300 students around half of whom are in-house children. Within the short span of a few years, it has also become a fundamental establishment in Shwe Pyi Thar Township providing education for children of any religion and ethnic background. For this magical evening, Link for Aid and Chatrium Hotel Royal Lake Yangon have received the patronage of the Embassy of Italy in Yangon, and the support of numerous sponsors and partners. These include Headline Sponsors – Air Mandalay, Delco and Gaw Capital; Platinum Sponsors – Grand Royal and Longines; Gold Sponsor – Peperoni; Silver Sponsors – 100 Plus, Asia Trails, Bin64, KHG Development, Myanmar Beer; Bronze Sponsors – All Asia Exclusive Tour, EXO Travel, Forever Wedding Studio, Myanmar Kipling Tour, Prestige Media, She Shine Jewelry, and Boutique Sponsor – Milano Esmod. Special thanks to Music for Myanmar Media Partners – 5 Plus, Myanmar Times and MYANMORE;and Event Partners – Image Diplomacy, Kaus Group, Outdoor Network and Star Event Production. 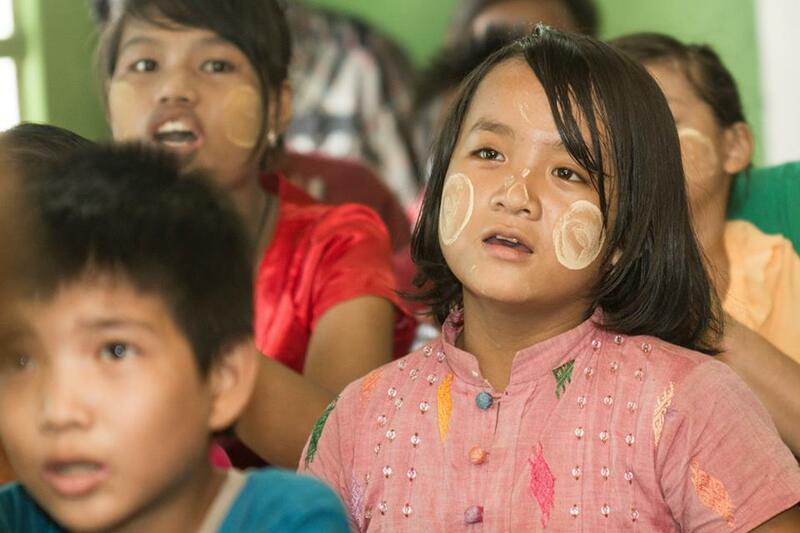 Support Music for Myanmar in raising awareness and funds for these children. 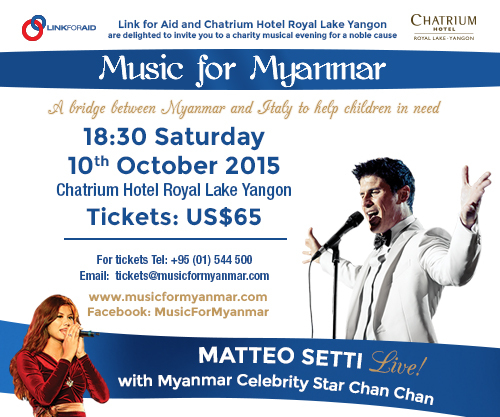 Pre-book your ticket at tickets@musicformyanmar.com or by calling +951 544500. 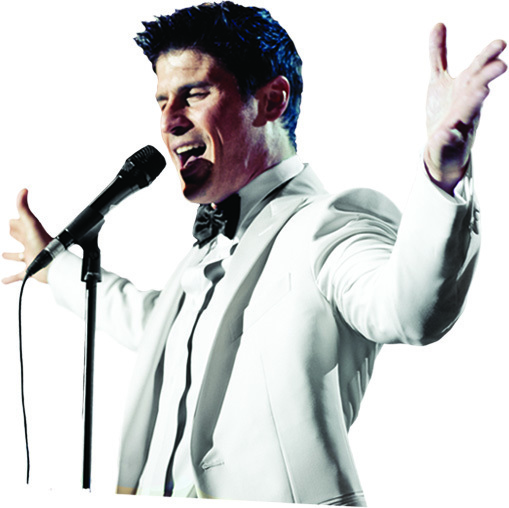 Concert tickets cost $65 and include dinner with free-flow wine, beer, whisky and soft drinks. Please visit http://www.musicformyanmar.com and connect with Music for Myanmar on Facebook.